Former Miami Dolphins and Hurricanes offensive lineman Vernon Carey is teaming up with Royal Pig Pub to promote literacy. FORT LAUDERDALE, Fla. - Books, bears and beers, oh my! It seems like an unlikely trio, but it's real. From now through Dec. 16, visit Royal Pig Pub in Fort Lauderdale and with a $10 donation receive a free schooner of beer or Tito's cocktail for a future visit. The donation will go toward purchasing a book and matching stuffed animal. It's all part of the third annual Holiday Book and Bear Drive. 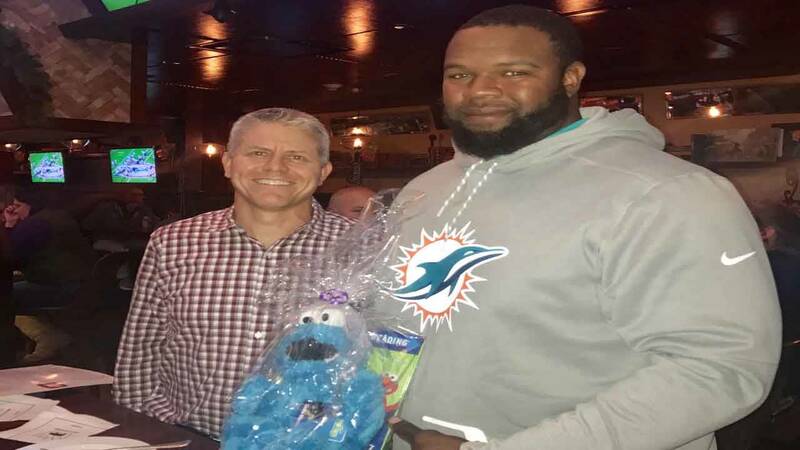 Retired Miami Dolphins and Miami Hurricanes offensive lineman Vernon Carey teamed up with Royal Pig Pub to distribute the books to children at schools and organizations in Fort Lauderdale's Sistrunk neighborhood. Royal Pig Pub is located at 350 E. Las Olas Blvd. The Vernon Carey Foundation creates programs and provides support to encourage the improvement of our youth. The programs are designed to enhance educational and recreational development, along with creating economic opportunities within the community. For more information on the Vernon Carey Foundation, visit www.VernonCarey72Foundation.org.